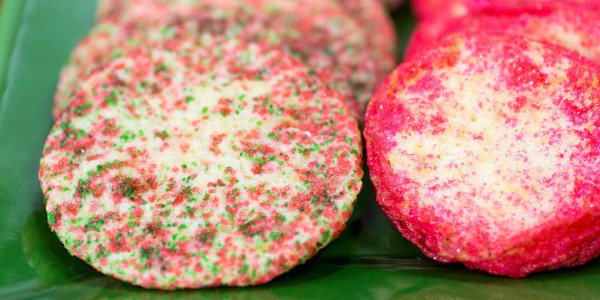 Get ready for cookie-swap season. 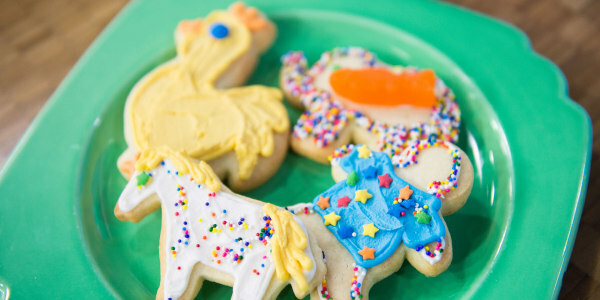 It's cookie swap season — but unlike gingerbread cookies, sugar cookies are perfect all year round, so bookmark this recipe for your next baby shower, Halloween, Valentine's day, or — my favorite — July 9, which is National Sugar Cookie Day! 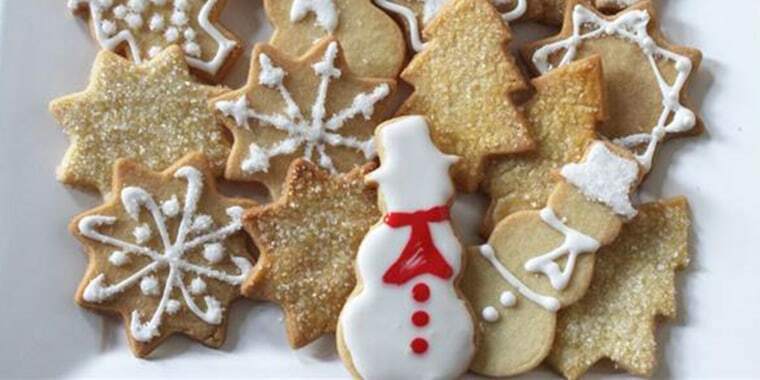 Cookies, rolled and cut into holiday shapes then festively decorated, are essential around the holidays. 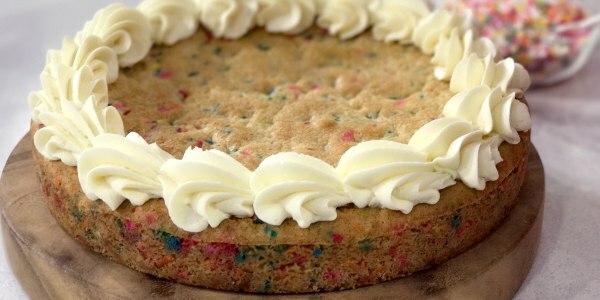 And these cookies in particular are fantastically delicious and easy to bake. Plus, decorating them is a snap and the whole family can involved. Simply choose from three simple decorations to make them your own, brush with an egg wash and sprinkle with sugar before baking, glaze with white icing (use a squeeze bottle for easy handling) or glaze with a mix of white and colored icings. Make-ahead tip: These cookies can be stored between sheets of wax paper in an airtight container for up to one week. In a standing electric mixer fitted with a paddle attachment, beat the butter with the sugar on medium speed until fluffy, about 2 minutes. Add the egg yolks, vanilla and salt and beat until combined. Add the flour and beat on low speed until moistened. Divide the dough into 3 discs, wrap them each in plastic and refrigerate until chilled, about 30 minutes. Roll out and stamp the dough. Preheat the oven to 350 degrees and line 3 baking sheets with parchment. Working with one disc of dough at a time, on a floured surface, roll the dough ¼-inch thick. Stamp out as many cookies as possible. Transfer the cookies to a baking sheet, and spread them out about 1-inch apart. Gather the scraps and re-roll to make more cookies. Bake the cookies in the center of the oven until lightly browned, 12 to 14 minutes. Let them cool slightly, then transfer the cookies to wire racks to cool completely. Repeat with the remaining dough, re-rolling the scraps. In a bowl, whisk the egg whites until frothy. Add the lemon juice and confectioners' sugar until smooth. Spread the white glaze over the cookies, covering them completely and let them dry. Transfer the remaining glaze to a piping bag or a squeeze bottle with a tiny tip and pipe designs all over the cookies. Sprinkle with sanding sugar, if desired. Let the cookies dry completely, then transfer them to platters to serve. 1. Lightly brush the unbaked cookies with a mixture of 2 egg yolks combined with 2 tablespoons of water. Let the egg wash dry slightly, then sprinkle with sanding sugar. Bake the cookies as directed above. 2. Divide the glaze into bowls and add food coloring to each. Glaze the cookies with one solid color then pipe dots or lines onto the wet glaze. Let the cookies dry completely before serving. Grace Parisi is a New York City-based food writer, cookbook author and food stylist. Her book, Get Saucy, was nominated for a James Beard award. Follow her on Instagram and Twitter.